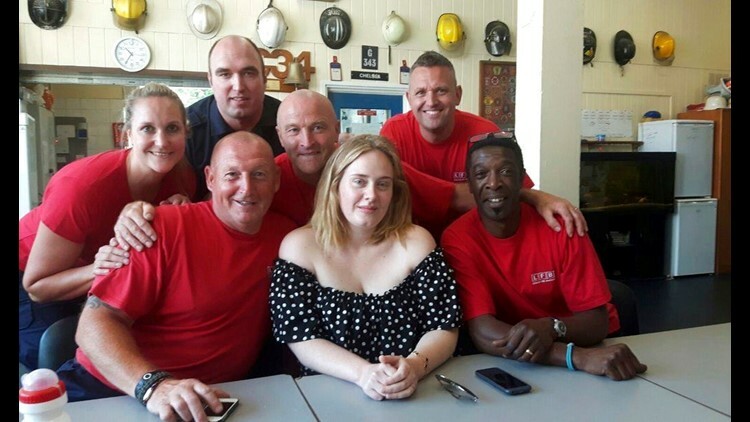 London's fire department posted photos of Adele meeting with firefighters to offer support following a devastating fire in the borough that is believed to have killed 79 people. LONDON (AP) — London's fire department posted photos of Adele meeting with firefighters to offer support following a devastating fire in the borough that is believed to have killed 79 people. "She just turned up at the station and knocked on the window and said she has some cakes for us," station manager Ben King said. "So we opened the door to her and then she took her sunglasses off and said: 'Hi, I'm Adele.'" London has rallied behind firefighters with a mixture of awe and support after the blaze. Flames engulfed the building in less than an hour early on June 14, trapping many residents. Firefighters tried to save as many as they could. "We are so humbled by everyone's support," the London Fire Brigade tweeted. Firefighter Rob Petty posted the photographs of the Hello singer on Facebook. "Not everyday the wonderfully grounded and caring Adele pops into Chelsea Firestation for a cup of tea and a cuddle x," he wrote.